Not long from debuting the D Rose 4, adidas has already taken the reins on showing more colors of Chicago Bulls superstar point guard Derrick Rose&apos;s new shoe. Being nicknamed as the "Chicago Southside" colorway, this recent edition of the signature shoe actually pays homage to the player&apos;s former high school, Simeon Career Academy (formerly Simeon High) -- a place where Rose became a Chicagoland prep legend. 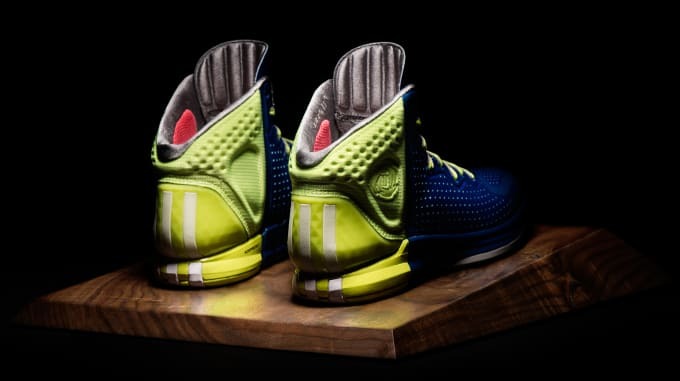 The Chicago Southside version of the D Rose 4 makes use of exaggerated hues of blue and yellow to further demonstrate the design of the shoe, a sneaker that cuts virtually through the middle with high contrast. The D Rose 4 continues its new tradition of stamping the shoe with the D Rose logo, which resembles a rose made of petals, his jersey number, and first initial to expound on his family and himself as a sum of his parts. The adidas D Rose 4 will release on October 10.